My older brother loves to paint native scenes, vintage items or has something to do with everyday Filipino way of life. 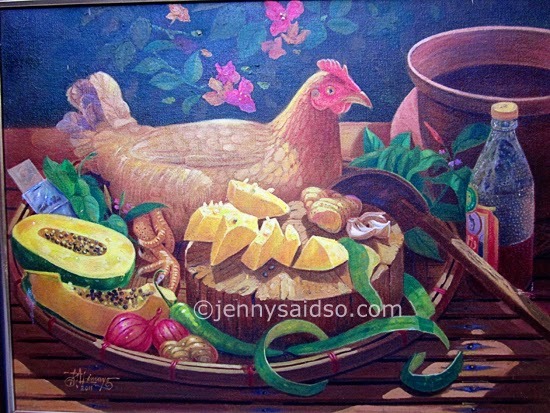 This painting is titled "TINOLA NI LOLA", oil on canvas and measures 2ft x 3ft. "Tinola", is a soup based dish with chicken with ginger, papaya and other seasonings composed mainly of patis (fish sauce). He said he was inspired to paint this because it reminds him of his younger years when my grandma used to cook tinola for us especially on a cold rainy day. See more paintings of my brother here.